A panoramic tour that covers all the major points of interest on the eastern side of the Lofoten islands amidst mountains, sea and fishing villages. We leave Leknes (Gravdal)and travel eastwards along the main road. Our first stop is Henningsvaer. 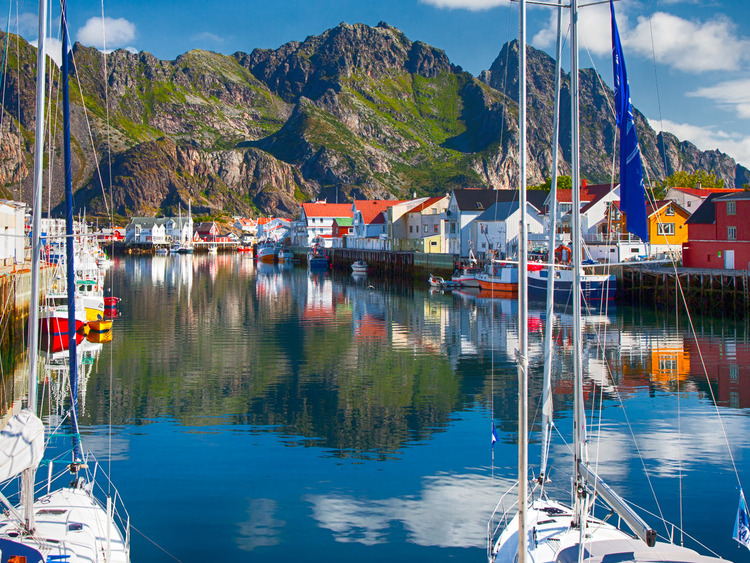 One of Norway's most picturesque fishing villages, it nestles like a jewel set among the surrounding mountain peaks. Until 1962, when the fishing industry on the Lofoten Islands was at the height of prosperity, over 6,000 fishermen would live here from January to April. Many artists have caught the light and the beauty of nature on these islands in their works. We visit the Lofoten Hus Gallery, where we watch a multi-media presentation following the fishing industry, nature and the inhabitants of the Lofoten Islands through the seasons. We also find a photographic collection, which includes an exhibition on sea eagles and some shots of the Lofoten Islands taken by the famous photographer Wilse, dating back to 70-90 years ago. Our excursion continues on to Svolvær, the most important town on the Lofoten Islands. Our next stop is the famous peak of Vaagekallen. Here, well visit the Ice Gallery: as we enter, well be provided with a warm fur so we can contemplate the incredible sculptures created in the ice by artists from all over the world, which are illuminated and presented with background sounds and music. After a stop for some free time to wander the streets of Svolvær, we take the same route back to the island of Vestvågøy. Leaving the main road, we now turn inland. Awaiting us is a view of the mountain ridge of the Lofoten Islands, which forms a natural breakwater. The ports on the eastern side of the islands are well protected from the Norwegian Sea and are of major importance for the islanders. During the last stop of our excursion, we make a photo stop at the panoramic viewpoint of Hagskaret. From here we can gaze across the Norwegian Sea, the Vestfjord and mainland Europe. Our visit over, we return to the pier in Buksnesfjord.